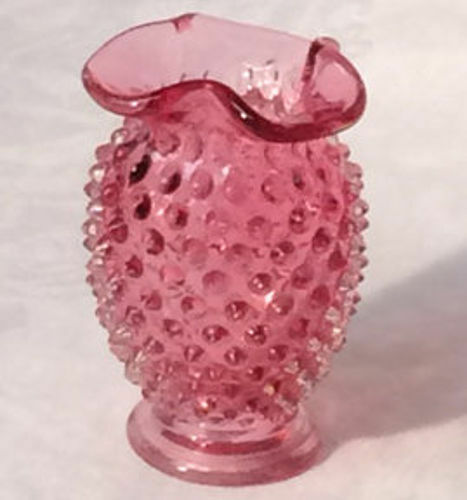 Fenton made this Cranberry Opalescent Hobnail Wide-mount mini vase in the late 1940's. 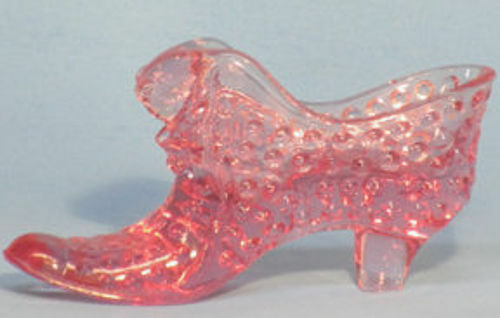 It is about 3.75" tall and in mint condition. This wide-mount vase is hard to find. 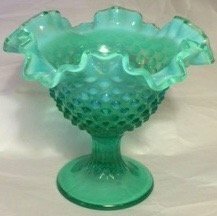 Fenton Green Opalescent Hobnail Compote, 7.5"
Fenton Green Opalescent Hobnail Compote in excellent condition. Made in the 1950's. 7.5" tall, 6.5" at the widest. 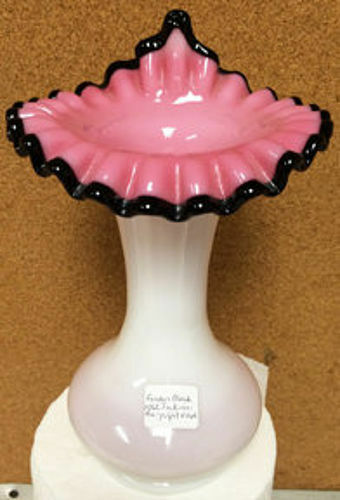 Fenton made Black Rose for a little over one year from 1953-54. 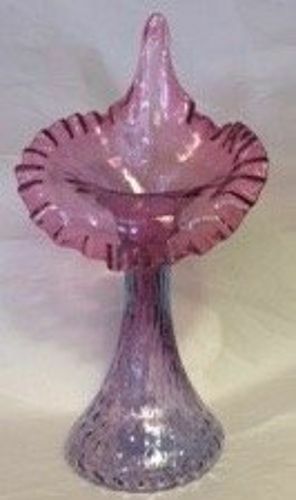 This 8.5" Jack-in-the-Pulpit vase is in mint condition. All of Black Rose is considered rare. 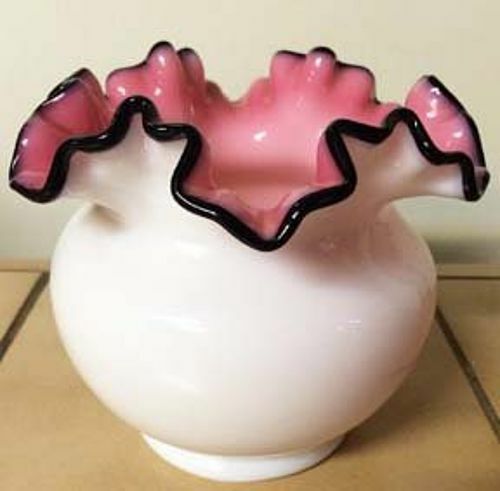 Fenton made Black Rose for a little over one year from 1953-54. 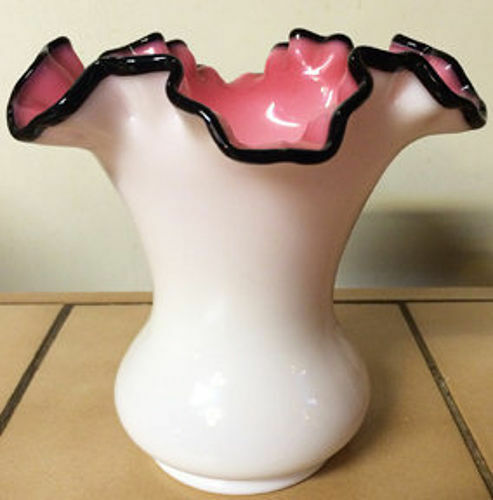 This 6.5" Flared vase is in mint condition. All of Black Rose is considered rare. 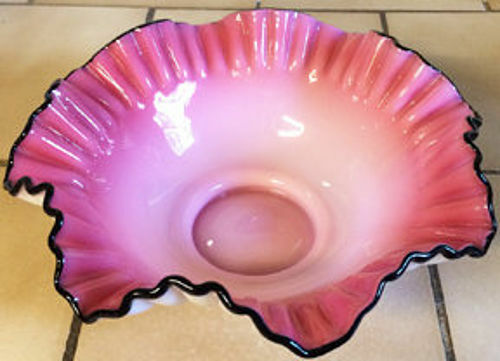 Fenton made Black Rose for a little over one year from 1953-54. This 4" squat vase is in mint condition. All of Black Rose is considered rare. 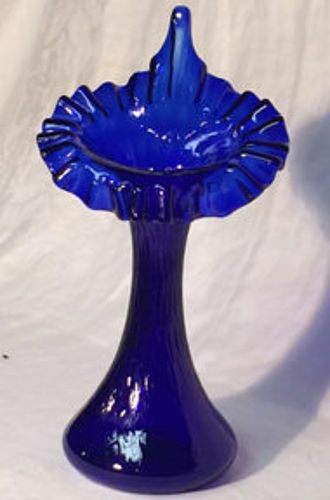 Fenton made Bubble Optic Opaque Blue Overlay from 1961-64. 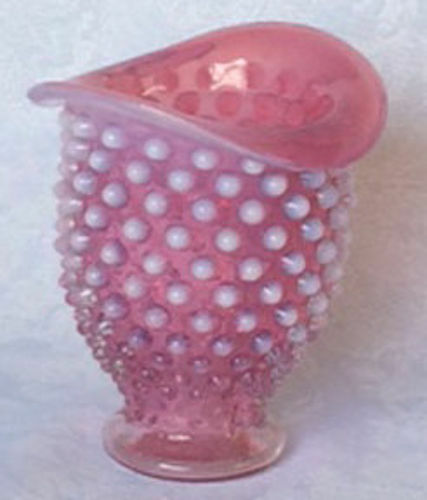 This 11" vase is the largest they produced in the bubble pattern, and is in mint condition. Tiffin made the crystal bowl, not sure who made the griffin (dragon) cutting. Some very, very slight roughage in top interior rim, otherwise, in excellent condition. 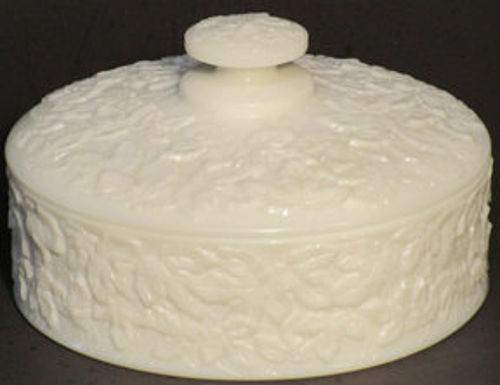 The Colony Harvest molds were first used to produce beautiful snowy white, handmade milk glass items. 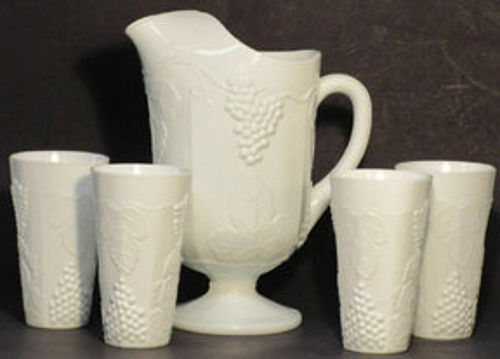 The milk glass items were called Colony Harvest. Colony is a trademark of the Lancaster Colony Corporation. 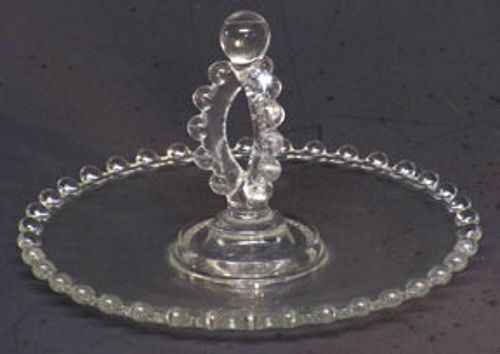 Indiana Glass produced the milk glass Harvest items but they were never sold under the Indiana Glass name. This set of Pitcher and 7 Tumblers are in mint condition. The pitcher is 11" tall and the tumblers are each 6" tall. (photo shows 4 tumblers -- it comes with all 7). First produced in the 1950's. 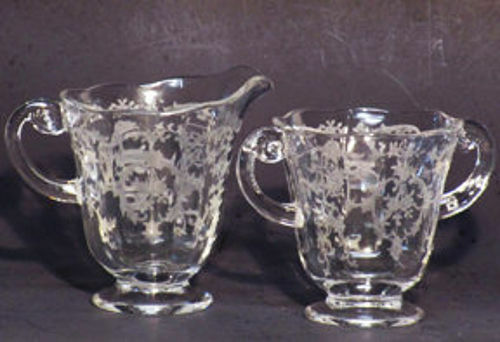 Fostoria Navarre etched Creamer and Sugar. Produced from 1936-82. In mint condition. Westmoreland started making Old Quilt in the early 1900's up until their end in 1984. 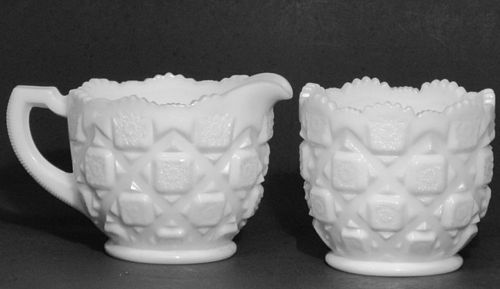 This milk glass Creamer & Sugar set is pretty hefty and measures 4" tall. In mint condition, no chips! Marked with logo on bottom. Westmoreland made the pattern Bramble (maple leaf composite) in the 1950's. This milkglass covered candy has a 7" diameter. In mint condition.